Betfair is a lot of things. It’s a betting exchange that allows punters to bet against each other. It’s an Australian business trying to make profit. It’s an employer of over 100 Australian staff. It doesn’t profile customers or ban winners. Like any business, Betfair’s main priority is survival and, hopefully, financial success. However, knowledgeable voices in the betting industry know it’s a crucial part of the wagering ecosystem. Arguably, significantly more so than any individual corporate bookmaker. These conversations are usually well received by industry partners, such as racing or sporting bodies. And an agreement between how much Betfair pays these organisations to manage bets on their sport or racing code is balanced. Every party, including the punter, is considered. Sometimes, racing and sporting bodies struggle to understand Betfair’s value in the industry and create product fee agreements that overlook the unique model. One of the best ways to illustrate disproportionate agreements is to look at the Betfair agreements with Racing Victoria and Racing NSW. We’d like to expand on this and be fully transparent with our customers. Despite Betfair’s pleas, Racing NSW has implemented a Back Bet Volume model. This means Betfair pays 2-3% (depending on the race day) of every ‘Back’ bet to Racing NSW, which is incredibly challenging for a low-margin business. The Back Bet Volume method is in stark contrast to the Revenue Sharing model that most other racing and sporting bodies use. By sharing revenue, as the name suggests, both Betfair and the industry body benefit from growth. They are incentivised to grow the popularity of a sport, as well as the betting turnover. A Back Bet Volume method leaves Betfair with little alternative but to raise prices (Racing NSW has the highest commission rate at Betfair). The agreements can be best illustrated by looking at what happens when Winx runs in New South Wales vs Victoria. Back Bet Volume vs Revenue Sharing. The table above show that Betfair is charged between 175.7% and 1,061.7% of its TOTAL revenue by Racing NSW when Winx wins. That’s BEFORE paying GST, Point of Consumption tax, staff, marketing, rent and licensing fees. On the other hand, when Winx runs in Victoria, Betfair and Racing Victoria share in the revenue generated and neither partner makes a loss. These product fee relationships ultimately impact the punter. NSW Racing is the most expensive betting product for Betfair, and it’s why the Market Base Rate is 10%. We have to pass that on to customers or we can’t bet on the market at all, which we believe impacts the entire industry. Additionally, the decisions made by Racing NSW seem to influence Harness NSW and Harness ACT. Both these harness bodies have adopted similar models, which isn’t helping an already challenged sport. Another example of short sighted pricing agreements is occurring with Australia’s two primary football codes. The betting turnover on AFL, our cheapest betting product, is growing at 19% after three rounds. While the NRL, based in NSW, is declining at 13% after four rounds. We acknowledge that this is a small sample size and NRL had an MBR of 2.5% (instead of 6%) in 2018. However, we’re confident this betting trend will continue. In fact, we forecast the betting popularity gap will increase rather than decrease. 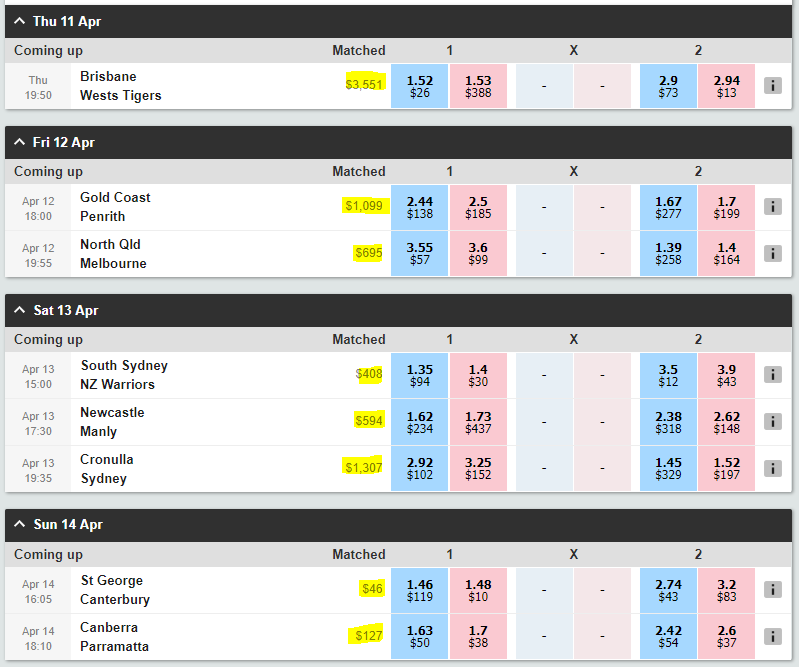 Punters want to bet on, and watch, the sports that give them a better chance of winning in the long term. You can see that from the early betting turnover in the images below. Betting turnover, at 10am on 10/4/19, is 1,954% bigger per game on AFL than NRL. Total AFL betting turnover, to this point, is $180,883. Whereas the NRL is $7,827. Betfair works hard to convey its unique business model to racing partners. Sadly, that can be overlooked by industry bodies who don’t understand that Betfair is significantly different from corporate bookmakers. Bookies profile their customers, ban winners and operate with significantly more margin in their markets. And despite these disproportionate agreements, Betfair is still committed to offering markets that cost them over 10x more to operate, before double tax and additional expenses, than they generate in commission. Like Winx in the George Ryder Stakes. We’ll continue lobbying industry bodies so that they can see the benefit of Revenue Sharing models. Using examples like the AFL and Racing Victoria, where both parties are committed to growing the audience, the profile and the betting turnover. And ultimately, this helps the punter. 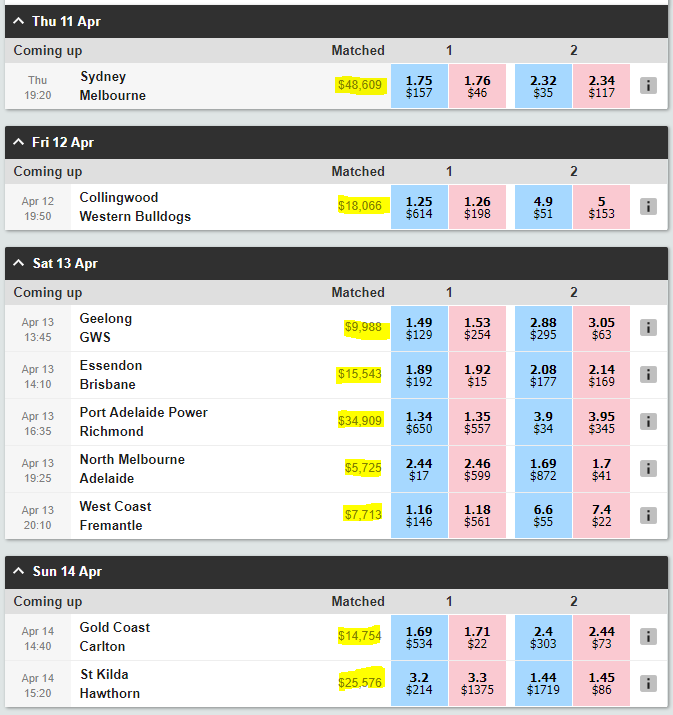 As you can see in 102.5% AFL markets and 106% Victorian racing markets, which have no peer.